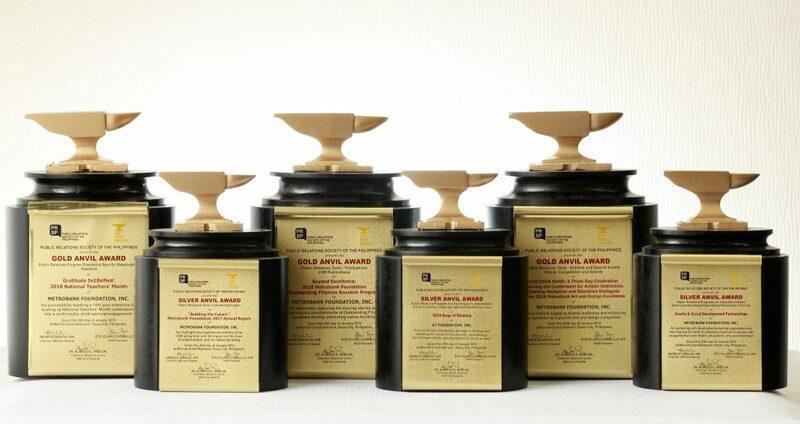 The Metrobank Foundation, Inc. (MBFI) received six (6) trophies at the 54th Anvil Awards on January 30, 2019 at the Grand Ballroom of the Manila Marriott Hotel, Pasay City. Organized by the Public Relations Society of the Philippines (PRSP), the Anvil is the symbol of excellence in public relations awarded by distinguished multi-sectoral jury to outstanding public relations programs and tools. MBFI received three (3) Gold Anvils and three (3) Silver Anvils. Awarded with Gold Anvil is “Gratitude In10sified: 2018 National Teachers’ Month (NTM),” a movement led by MBFI and the Department of Education which recognizes Filipino teachers and educators for their contribution to national development. The movement marked its 10th milestone year in 2018 with the “Gratitude In10sified” campaign which aims to intensify all efforts in recognizing the indispensible role of Filipino teachers in shaping minds across generations. NTM is celebrated for an entire month from September 5 to October 5. Another Gold Anvil was given to “Beyond Excellence: 2018 Metrobank Foundation Outstanding Filipinos Souvenir Program.” The publication narrates moving stories and inspiring accomplishments of the 2018 Metrobank Foundation Outstanding Filipinos. Given that an Outstanding Filipino is a model of excellence in his or her chosen profession, it is imperative that their professional achievements, best practices and personal life accounts are narrated and disseminated in hopes of reaching like-minded individuals so they, too, can be positive agents of change in nation-building. While the annual publication highlights the Outstanding Filipinos, it also serves as an acknowledgment of the Foundation’s partners whose support is invaluable to the success of the search. The third Gold Anvil was conferred to “Discover MADE,” a culmination of the Search for 2018 Metrobank Art & Design Excellence (MADE) in Painting and Sculpture which featured three components— MADE Awarding Ceremony, Exhibit Opening, and Lecture Series on Philippine Arts and Cultural Heritage. The event engages a diverse group of audiences, comprising of the competition participants, art and design community, special interest groups and passionate supporters of art. Meanwhile, awarded with Silver Anvil is the “2018 Bags of Blessing,” an annual gift-giving project of the late Metrobank founder and group chairman Dr. George S.K. Ty every Chinese New Year, spearheaded by the GT Foundation, Inc., the Ty family foundation. The project seeks to bring together employees of GT Capital Holdings and Metrobank Group of Companies, as well as institutional partners to participate in the tradition of sharing and giving back in gratitude for a prosperous year through the distribution of 10,000 bags of food items worth Php 1,000 to 10,000 indigent families. Another public relations program which earned a Silver Anvil is “Grants and Social Development Partnerships,” MBFI’s instrument in nation-building through meaningful collaborations with development organizations in order to produce positive and lasting ripples. Under this program are MBFI’s priority thrusts—HEAL (Health, Education, Arts & Livelihood)—which are anchored on selected United Nations’ Sustainable Development Goals (SDGs) and the Philippine Development Plan. Moreover, under the public relations tool, MBFI also took home a Silver Anvil for “Building the Future: Metrobank Foundation 2017 Annual Report.” The annual report chronicles MBFI’s continuous growth as a corporate foundation, and features the inspirational stories of chosen stakeholders who work in the spirit of cooperative effort to build the future of the nation. By highlighting stakeholder stories, the publication underscored the successful implementation of its corporate social responsibility programs, not only presenting significant figures and statistics but also allowing readers to appreciate the impact on these programs on lives of the stakeholders. MBFI has been winning Anvil awards since 1985. To date, it has won 83 Anvil awards for its various programs and public relations tools, including the much coveted Grand Anvil gaining the record as the first corporate foundation to win a back-to-back Grand Anvil (2009 and 2010) and 2 Platinum Anvils in the history of the award-giving body.